The tomato fruitworm is the most serious insect pest of tomatoes in the US, feeding on fruit and contaminating it with insect parts, excrement and decay-causing organisms. Interest in spraying insecticides to control the fruitworm was accelerated in the 1930s by the finding of insect fragments in canned products, which were seized and destroyed as adulterated foods by the FDA. 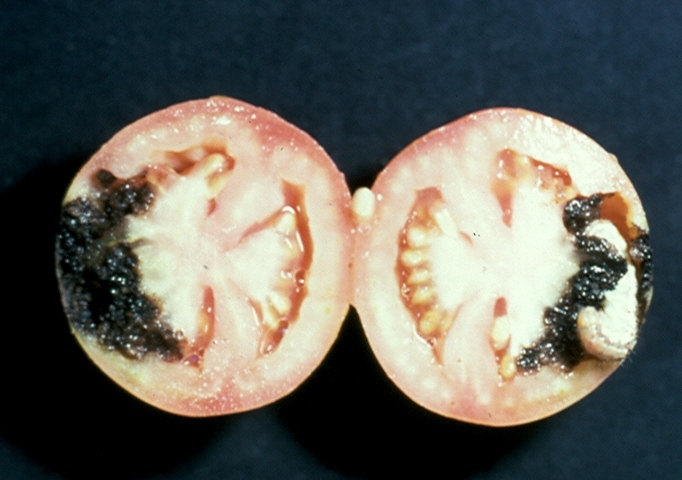 Today, insecticides are used to prevent widespread insect damage to tomatoes and tomato shipments for processing are rejected if more than 2% damage is found. Therein is the dilemma. If the standard was relaxed (say to 4%), tomato growers could probably make one less insecticide spray. However, consumers may not want more insect fragments in canned tomatoes and may actually want a tighter standard which would result in more insecticide sprays. “All loads of processing tomatoes in California are evaluated by inspectors from the Processing Tomato Advisory Board, a marketing order, under the direction of supervising inspectors from the California Department of Food and Agriculture. A load of processing tomatoes is rejected if 2% or more of the tomatoes by weight have a worm or excreta in the flesh of the tomato. The damage tolerance acceptable to consumers and industry could be changed accordingly. Increasing the tolerance might be expected to result in a reduced number of insecticide applications when used in conjunction with a careful monitoring program. Authors: Zalom, F. G., and A. Jones. Source: Journal of Economic Entomology. February, 1994. 87:181-186. This entry was posted in Insecticides and tagged America, California, California Department of Food and Agriculture, FDA, fruit, insecticides, insects, Processing Tomato Advisory Board, Tomato Fruitworm, tomatoes by pesticide guy. Bookmark the permalink.